Microsoft Azure SQL Database and SQL Data Warehouse provide a relational database service for Azure and other Internet-based applications. To help protect your data, firewalls prevent all access to your database server until you specify which computers have permission. The firewall grants access to databases based on the originating IP address of each request. This article applies to Azure SQL server, and to both SQL Database and SQL Data Warehouse databases that are created on the Azure SQL server. For simplicity, SQL Database is used when referring to both SQL Database and SQL Data Warehouse. This article does not apply to Azure SQL Database Managed Instance. Please see the following article on connecting to a Managed Instance for more information about the networking configuration needed. In addition to IP rules, the firewall also manages virtual network rules. Virtual network rules are based on Virtual Network service endpoints. Virtual network rules might be preferable to IP rules in some cases. To learn more, see Virtual Network service endpoints and rules for Azure SQL Database. Initially, all access to your Azure SQL server is blocked by the SQL Database firewall. To access a database server, you must specify one or more server-level IP firewall rules that enable access to your Azure SQL server. Use the IP firewall rules to specify which IP address ranges from the Internet are allowed, and whether Azure applications can attempt to connect to your Azure SQL server. To selectively grant access to just one of the databases in your Azure SQL server, you must create a database-level rule for the required database. Specify an IP address range for the database IP firewall rule that is beyond the IP address range specified in the server-level IP firewall rule, and ensure that the IP address of the client falls in the range specified in the database-level rule. SQL Data Warehouse only supports server-level IP firewall rules and does not support database-level IP firewall rules. These rules enable clients to access your entire Azure SQL server, that is, all the databases within the same SQL Database server. These rules are stored in the master database. Server-level IP firewall rules can be configured by using the portal or by using Transact-SQL statements. To create server-level IP firewall rules using the Azure portal or PowerShell, you must be the subscription owner or a subscription contributor. To create a server-level IP firewall rule using Transact-SQL, you must connect to the SQL Database instance as the server-level principal login or the Azure Active Directory administrator (which means that a server-level IP firewall rule must first be created by a user with Azure-level permissions). These rules enable clients to access certain (secure) databases within the same SQL Database server. You can create these rules for each database (including the master database) and they are stored in the individual databases. Database-level IP firewall rules for master and user databases can only be created and managed by using Transact-SQL statements and only after you have configured the first server-level firewall. If you specify an IP address range in the database-level IP firewall rule that is outside the range specified in the server-level IP firewall rule, only those clients that have IP addresses in the database-level range can access the database. You can have a maximum of 128 database-level IP firewall rules for a database. For more information on configuring database-level IP firewall rules, see the example later in this article and see sp_set_database_firewall_rule (Azure SQL Database). Microsoft recommends using database-level IP firewall rules whenever possible to enhance security and to make your database more portable. Use server-level IP firewall rules for administrators and when you have many databases that have the same access requirements and you don't want to spend time configuring each database individually. Windows Azure SQL Database supports a maximum of 128 IP firewall rules. For information about portable databases in the context of business continuity, see Authentication requirements for disaster recovery. If the IP address of the request is within one of the ranges specified in the database-level IP firewall rules, the connection is granted to the SQL Database that contains the rule. If the IP address of the request is not within one of the ranges specified in the database-level IP firewall rule, the server-level IP firewall rules are checked. If the IP address of the request is within one of the ranges specified in the server-level IP firewall rules, the connection is granted. Server-level IP firewall rules apply to all SQL databases on the Azure SQL server. If the IP address of the request is not within the ranges specified in any of the database-level or server-level IP firewall rules, the connection request fails. To access Azure SQL Database from your local computer, ensure the firewall on your network and local computer allows outgoing communication on TCP port 1433. To allow applications from Azure to connect to your Azure SQL server, Azure connections must be enabled. When an application from Azure attempts to connect to your database server, the firewall verifies that Azure connections are allowed. A firewall setting with starting and ending address equal to 0.0.0.0 indicates Azure connections are allowed. If the connection attempt is not allowed, the request does not reach the Azure SQL Database server. This option configures the firewall to allow all connections from Azure including connections from the subscriptions of other customers. When selecting this option, make sure your login and user permissions limit access to only authorized users. The first server-level firewall setting can be created using the Azure portal or programmatically using Azure PowerShell, Azure CLI, or the REST API. Subsequent server-level IP firewall rules can be created and managed using these methods, and through Transact-SQL. 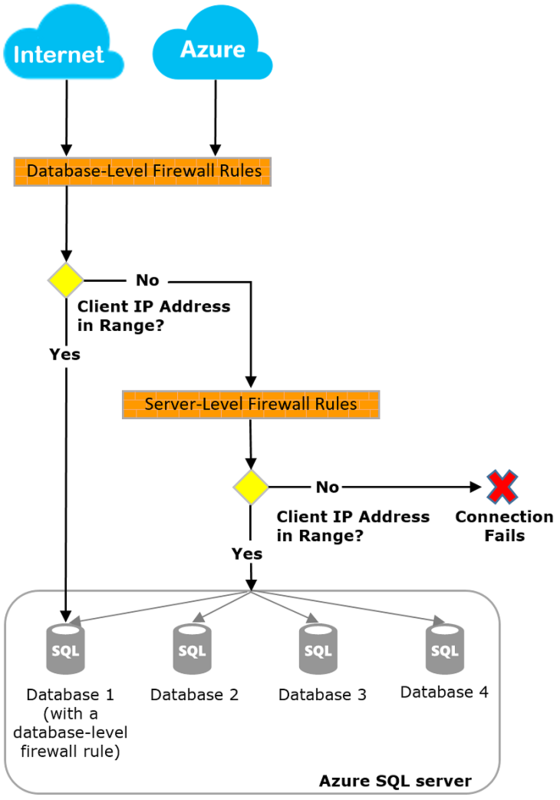 Database-level IP firewall rules can only be created and managed using Transact-SQL. To improve performance, server-level IP firewall rules are temporarily cached at the database level. To refresh the cache, see DBCC FLUSHAUTHCACHE. You can use SQL Database Auditing to audit server-level and database-level firewall changes. To set a server-level IP firewall rule in the Azure portal, you can either go to the Overview page for your Azure SQL database or the Overview page for your SQL Database server. For a tutorial, see Create a DB using the Azure portal. To set a server-level IP firewall rule from the database overview page, click Set server firewall on the toolbar as shown in the following image: The Firewall settings page for the SQL Database server opens. Click Add client IP on the toolbar to add the IP address of the computer you are currently using and then click Save. A server-level IP firewall rule is created for your current IP address. The overview page for your server opens, showing you the fully qualified server name (such as mynewserver20170403.database.windows.net) and provides options for further configuration. Next, add a server-level IP firewall rule. The PowerShell Azure Resource Manager module is still supported by Azure SQL Database, but all future development is for the Az.Sql module. For these cmdlets, see AzureRM.Sql. The arguments for the commands in the Az module and in the AzureRm modules are substantially identical. -FirewallRuleName "AllowSome" -StartIpAddress "0.0.0.0" -EndIpAddress "0.0.0.0"
Q. Should users of one database be fully isolated from another database? If yes, grant access using database-level IP firewall rules. This avoids using server-level IP firewall rules, which permit access through the firewall to all databases, reducing the depth of your defenses. Q. Do users at the IP address’s need access to all databases? Use server-level IP firewall rules to reduce the number of times you must configure IP firewall rules. Q. Does the person or team configuring the IP firewall rules only have access through the Azure portal, PowerShell, or the REST API? You must use server-level IP firewall rules. Database-level IP firewall rules can only be configured using Transact-SQL. Q. Is the person or team configuring the IP firewall rules prohibited from having high-level permission at the database level? Use server-level IP firewall rules. Configuring database-level IP firewall rules using Transact-SQL, requires at least CONTROL DATABASE permission at the database level. Q. Is the person or team configuring or auditing the IP firewall rules, centrally managing IP firewall rules for many (perhaps 100s) of databases? This selection depends upon your needs and environment. Server-level IP firewall rules might be easier to configure, but scripting can configure rules at the database-level. And even if you use server-level IP firewall rules, you might need to audit the database-level IP firewall rules, to see if users with CONTROL permission on the database have created database-level IP firewall rules. Q. Can I use a mix of both server-level and database-level IP firewall rules? Yes. Some users, such as administrators might need server-level IP firewall rules. Other users, such as users of a database application, might need database-level IP firewall rules. Before your computer can access Azure SQL Database, you may need to create a firewall exception on your computer for TCP port 1433. If you are making connections inside the Azure cloud boundary, you may have to open additional ports. For more information, see the SQL Database: Outside vs inside section of Ports beyond 1433 for ADO.NET 4.5 and SQL Database. Due to NAT, the IP address used by your computer to connect to Azure SQL Database may be different than the IP address shown in your computer IP configuration settings. To view the IP address your computer is using to connect to Azure, log in to the portal and navigate to the Configure tab on the server that hosts your database. Under the Allowed IP Addresses section, the Current Client IP Address is displayed. Click Add to the Allowed IP Addresses to allow this computer to access the server. There may be as much as a five-minute delay for changes to the Azure SQL Database firewall configuration to take effect. If a login does not have permissions on the Azure SQL Database server or the password used is incorrect, the connection to the Azure SQL Database server is denied. Creating a firewall setting only provides clients with an opportunity to attempt connecting to your server; each client must provide the necessary security credentials. For more information about preparing logins, see Managing Databases, Logins, and Users in Azure SQL Database. Ask your Internet Service Provider (ISP) for the IP address range assigned to your client computers that access the Azure SQL Database server, and then add the IP address range as an IP firewall rule. Get static IP addressing instead for your client computers, and then add the IP addresses as IP firewall rules. For a quick start on creating a server-level IP firewall rule, see Create an Azure SQL database. For help in connecting to an Azure SQL database from open source or third-party applications, see Client quick-start code samples to SQL Database.